1. 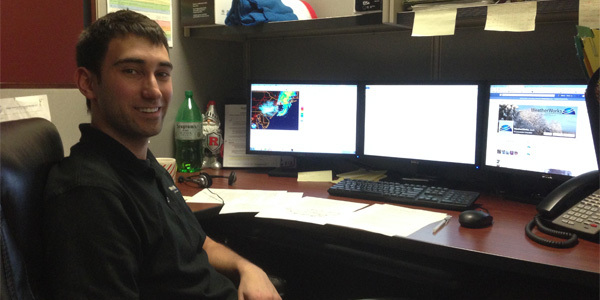 What school did you choose for meteorology and what did you enjoy most about your college experience? I attended Rutgers University from 2006 – 2010. It became an obvious choice when considering it was only one of two in-state colleges that offered meteorology, and it was close… but not too close to home. At first I was a little concerned about moving from the country setting of Warren County, NJ to New Brunswick, NJ. However, I quickly adapted to a more city life, and will be moving to a similar setting in Morristown, NJ in the near future. College taught me a lot, both from an educational and life standpoint. Many of my favorite moments occurred in college, ranging from the Rutgers Football win over Louisville my freshman year, to enjoying my first legal drink, to making friends for life. Most importantly, it led me to a career at WeatherWorks. 2. What other hobbies or sports do you do in your free time? First off, I try to stay as active as possible. Some of my favorite activities include playing guitar, golfing, and participating in random sports such as soccer and basketball. In the fall, fantasy football takes up a good chunk of my time as I attempt to dominate the WeatherWorks league. 3. How long have you known that you wanted to be a meteorologist? Did you know from an early age or was it a passion you developed over time? From an early age I was obsessed with snow. Additionally, being an avid fisherman and surfer along the Jersey Shore, coastal weather fascinated me. This gradually led to a fairly late decision during my junior year of high school to pursue a career in the field that I love. 4. If someone were to make a movie about your life, who would you hope would play you? While I wouldn’t consider myself Hollywood material, perhaps you could gather enough moments in my life to make a short film that goes straight to DVD. I don’t have a favorite actor, but Sean Connery seems like a pretty awesome guy with a cool accent, so I’ll go with him. 5. What would you say the most rewarding part of your job is? I enjoy forecasting the weather, and am fortunate to do so in the region that I grew up, northern New Jersey. I take my job very serious (as does our entire staff). Helping people make decisions that affect their day-to-day operations, which can be the difference in thousands of dollars, is certainly rewarding.